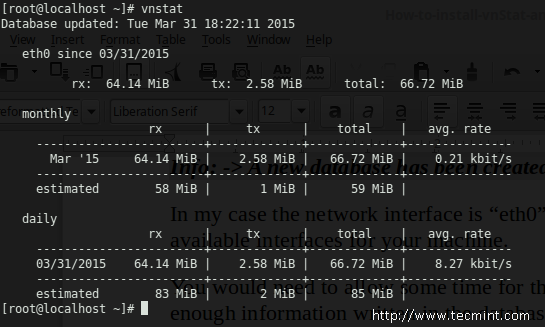 VnStat is a console based network traffic monitoring tool design for Linux and BSD. It will keep a log of the network traffic for a selected network interface/s. 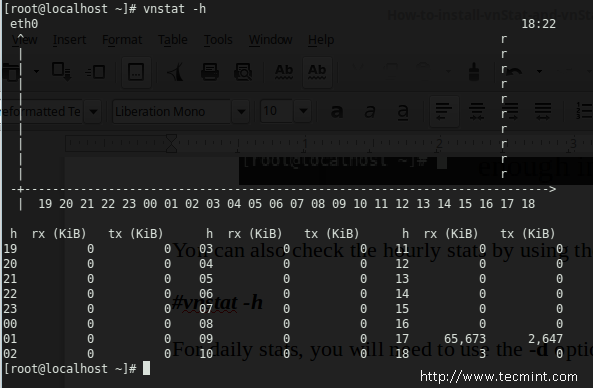 To generate the logs, vnStat uses the information provided by the kernel. In other words it will not sniff the network traffic and will ensue the lite usage of the system resource. To use this software under Linux you will need at least version 2.2 of the kernel series. The latest version of vnStat 1.13 has been released on January 18th, 2015 and includes several following features and fixes. –headertext – to customize the text in the image header. Customizable options for content positioning and image background color to vnStat.cgi. The interface bandwidth will be automatically detected. 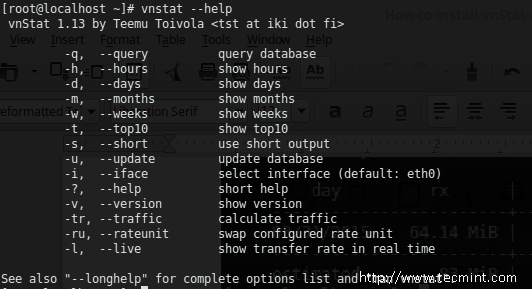 In this article, we will show you how to install vnStat and vnStati tool under RHEL/CentOS 7 systems to monitor real time network traffic. 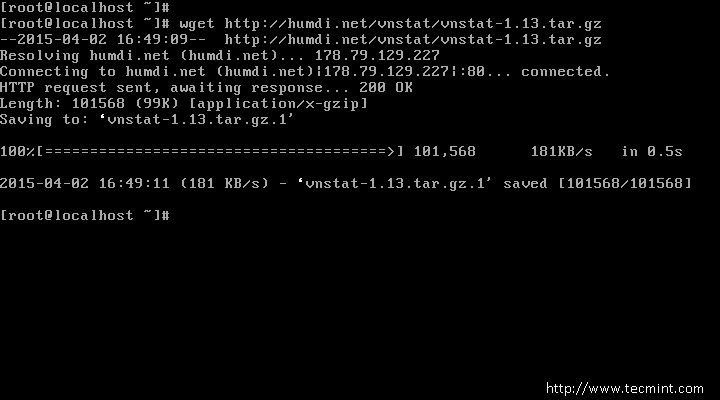 Alternatively, you can also use following wget command to download the latest source tarball as shown below. 2. Once you have downloaded the file, extract the archive using your terminal and then navigate to the location where you have extracted the archive and compile it using following commands. The vnStat daemon should have created this directory when started. Check that it is is configured and running. See also "man vnstatd". If it is missing you can create it by running following command. In my case the network interface is “eth0”, but this may vary. You can run ifconfig -a to check the available interfaces for your machine. The options in there are self explanatory so I won’t be stopping on each one of them. You can still review them if you wish to customize your installation. 10. To make the stats easier to read you can use the vnStati tool to generate .png images for vnStat. The information that both vnStat and vnStati provide can greatly help your network monitoring, analysis and troubleshooting in time. 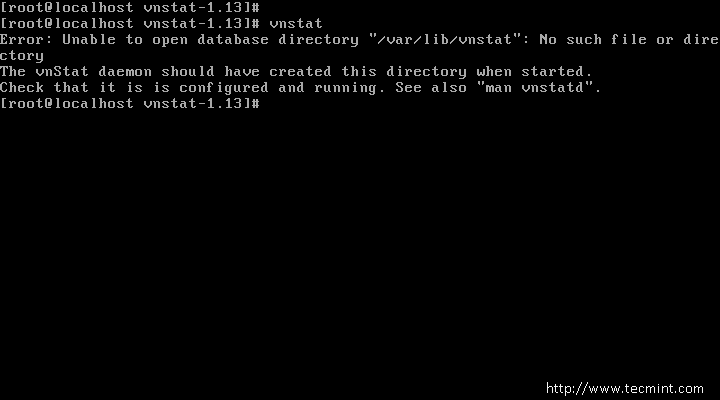 You may find more information about the available options of vnStat in the man page of the tool. If you have an additional suggestion or question about vnStat and vnStati please do not hesitate to submit your comment in the comment section below.